More than eighteen months ago we compiled a list of Video on Demand and Pay Tv service providers in Africa as a way of creating a quick reference list for anyone interested in the sector. Not much happened changed on the list in the subsequent half year, there didn’t seem to be any need to update it really – but in the past year the African VOD and pay TV service scene has undergone so much transformation that any sort of list or record would need some serious adjustments. Some services have folded under the extreme pressures that come with an aggressive market, new players have emerged backed by African investments while others have had to relaunch and rebrand. The market might be dominated by MultiChoice but that doesn’t mean it’s the only option. In fact, as the market leader has lost some subscribers in the past year, that change also suggests that subscribers have alternatives. In the following table, we have listed some of those alternatives, focusing on the more visible and active pay TV services in Africa. We considered services that have already registered a significant following as well as those that have made significant investments in content acquisition with a clear intention to have a major impact in several parts of the continent. The compilation is hardly conclusive. We will continue to update it and would love to add any pay TV service that will fit into that criteria. MultiChoice Satellite, Terrestrial, VOD Subscription, Rental South Africa The largest Pay TV provider on the continent, Multichoice has terrestrial Digital TV, Satellite(DStv, GOtv) and Internet TV via its DStv Box Office service. It also has a set-top box BoxOffice movie rental service, with an online version. Another service the company offers if DSTV Catchup which is a VOD catch-up service for pay TV premium subscribers. Netflix VOD Subscription USA Arguably the one brand synonymous with VOD, after leading in the USA and select countries it opened up it services to the whole world in 2016 and the African market was part of that expansion. A basic account costs $7,99 per month but the big drawback is content that's not as varied as the USA version because of territorial licensing issues. Showmax VOD Subscription South Africa Launched in August 2015 in South Africa The Naspers owned VOD service entered the market ahead of Netflix's arrival. It claims to have the widest content library in African VOD and its opened this up to 36 countries on the continent. Its mobile app has offline access and data management features to meet the challenging broadband conditions for viewers on the continent. Kwese TV VOD Subscription South Africa The yet to launch service (set for a debut before August 2016) is part of Econet Media. So far major content deals, mostly for sports entertainment, have been secured. Some of this content has already been flighted on Kwese Sports, the web platform launched with its announcement. the service looks primed to be one of the widest reaching IPTV services, especially if it relies on the strengths of Econet's resources plus its hand in broadband services in Africa. ONTAPtv VOD Subscription South Africa Launched in September 2015 as part of the post Netlfix announcement flood, it also set up base in South Africa. The service is owned by Asian tech giant PCCW Global and its reosurces have contributed to content acquistion. It is available via mobile and desktop apps. iROKOtv VOD Subscription Nigeria Probably the most visible Internet TV provider on the continent after giant brands like Netflix . Most content is Nollywood (Nigerian film industry where it is based) but it also has Bollywood, Hollywood and Korean and Telenovela content. It also signed B2B content deals to distribute its inventory via other platforms and it has also partnered with CANAL+ Group too bring mobile tv to Francophone Africa. VU VOD Subscription South Africa This was MTN South Africa's VOD baby which was launched as FrontRow and promoted with zero rated content for subscribers. It was later rebranded to VU (pronounced as View) and relaunched in December 2015. It has content from the 6 major Hollywood studios. Buni also creates its own shows such as the XYZ show, a political satire. A key difference from the other providers is that Buni was funded by ACP Cultures and the European Union , making it somewhat not as commercial as the rest. It was acquired by Trace TV in June 2016 as part of Trace's preps for a VOD presence. Tuluntulu Mobile app based VOD Advertising South Africa Launched in August 2014, Tuluntulu targets audiences in Africa, and globally, with African focused content delivered on its mobile content platform. Close to half a million users have downloaded the app. Its content is free. NuVu VOD Subscription Nigeria Launched in November 2015, NuVu is owned by global tech company Ericsson which has been partnering with mobile operators around Africa. It started with a Nigerian launch through an arrangement with Airtel and had Kenya in its sights for 2016. Wura.tv Mobile app based VOD Subscription Nigeria Launched in May 2014, Wura's content includes crowd sourced material that complements Afrocentric productions that include movies, culture shows and music. Aflix Mobile app based VOD Subscription, Rental Nigeria & US Available via mobile app only, Aflix launched in August 2014. The service is funded by Nigerian and American investors and already has quite an impressive collection of movies and shows from Hollywood, Bollywood and Telenovela. An executive of the company said when they launched that they were more in direct competition with Multichoice than iROKOtv which, he said, was "rather responding to our plan"
Zuku TV Satellite, VOD Subscription Kenya Kenya is their home and this is where they offer TV as part of a triple play service as well as a satellite TV service. It has an extensive fibre network from its ISP roots in the country. In other countries in the region like Uganda, Malawi, Tanzania and Zambia Zuku offers service via Satellite. Dobox VOD Rental Nigeria Dobox provide Nollywood movies, music and other Nigerian content for rental and also through MTN Dobox (a licensing of their content through the MNO. Initially the deal with MTN was mistaken for an acquisition by MTN. Airtel Live VOD US 3c per download. MNO Bundled Service Nigeria Launched by Airtel the global MNO, Airtel Live in Nigeria has Nollywood movies, Hollywood, local music videos, Premier soccer league content and other video. Referred to as the Naira 5 Entertainment Store, all video traffic for the service is zero rated so Airtel subscribers only pay 5 Naira for each movie downloaded. StarSat Satellite Subscription South Africa StarSat, South Africa is a subsidiary of the Chinese satellite television provider, StarTimes, operating in South Africa that began broadcasting on 1 May 2010. StarSat is owned by On Digital Media, who were granted a pay-TV license by ICASA in September 2007. On Digital Media is 20% owned by TV satellite operator SES and 20% owned by China’s StarTimes. Openview HD free-to-air satellite Advertising South Africa Owend by a South African company called company Platco Digital, a sister company to South African terrestrial broadcaster E.tv. was launched in October 2013. OpenView HD technical details here. The service has also gained traction outside South Africa in countries like Zimbabwe where it has emerged as an affordable alternative to DStv. AfricaFilms.tv VOD Rental, Download France Though based in France, their content is purely African. The platform is rich with current and old African titles (most produced with NGO assistance) from across the continent. Examples include Zimbabwean films like JIT. iBAKATV VOD Advertising, Rental Nigeria Owned by Ibaka Entertainment this service is a video portal and it is based on YouTube. It has however gained a strong following in Nigeria. The company claims they gets over 500,000 hits daily. Unlike other Nigeria VOD services that now have content from all over the world (Hollywood, Bollywood) iBAKATV focuses on Nollywood. 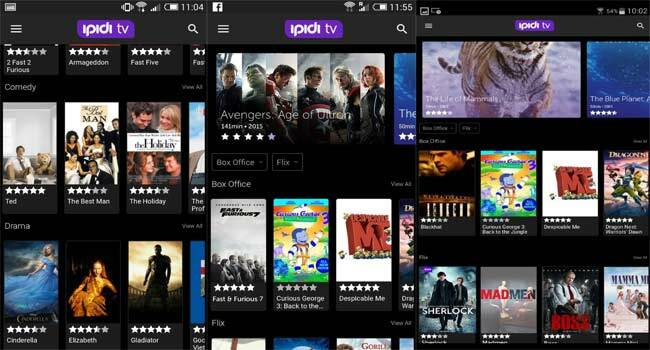 Un1ty TV VOD Subscription UK Based in London, Un1ty TV provides content via mobile apps and PC. It also has aUn1ty Smart Stick, which, if connected to a TV and WiFi network, streams Un1ty content on TV . Its content is focused on Africa and the Caribbean. PANA TV VOD Subscription USA Introduced in 2013, and launched officially in July 2014. Subscription is $4.99 a month. Pana TV has been in the news for signing up big brands like Samsung, Mercedes Benz. AzamTV Satellite Subscription Tanzania The team has claimed to have over 130,000 subscribers in Tanzania. Tired of all the commercials on DSTV, so an alternative, via Telkom adsl will be an absolute pleasure.